Coming back from a long weekend with my parents and brother, I can’t stop thinking about the credit card as it relates to my successes (and mainly failures) playing video games. For the most part, I found school pretty easy, and I enjoyed it. I still love learning, and I still don’t like making mistakes. Reading is my primary hobby. For my brother it’s video games. With storms in the mid-Atlantic , we spent a lot of time playing video games the past few days. Reading does not lend itself quite as easily as a shared activity across the generations. Yet, video games often get a bad rap. In fact, I’m collaborating on a Sophomore project right now that begins with this premise. However, I want to question that assumption in two key ways. 1. 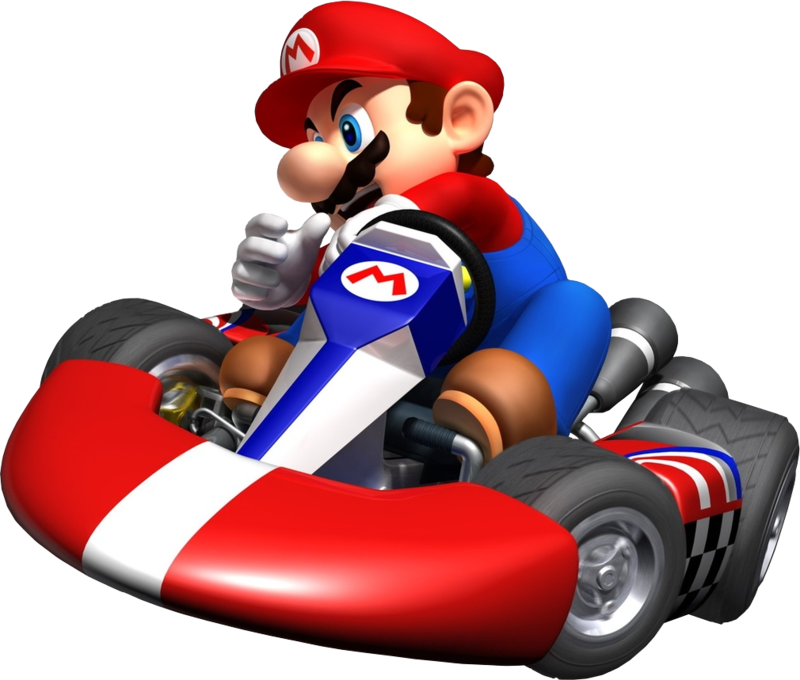 There is tremendous background knowledge required to understand video game systems and the norms in the games themselves. I don’t know where the X button is, what’s likely to make my character jump or that a Martian on screen represents a character from the early 1990s. If you were measuring my video game skill by lexile, it would be low. Not because I couldn’t understand it but because I haven’t yet learned the terminology. Scaffolding is important. The game where I experienced the most success is Mario Kart, largely because I played a lot of SNES Mario Kart when I was in middle school. I was wowed by my brother’s ability to enter a new game, navigate the controls, determine the purpose, and immediately act like he had a direct connection with the avatar on the screen. I can’t even look at the score on the screen while making my character move. He works in the medical field, and I can see how his ability to think quickly, parse new information and multitask would be assets that help him excel on a daily basis. Learning the basics in a field makes it much easier to move on to more advanced knowledge, often without even realizing that we’re using our tacit knowledge. 2. Video games teach resilience. The Switch is a forgiving system for new users. 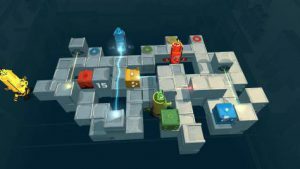 Death Squared, despite the macabre name, is a team puzzle solving game, a modern version of the logic games we used to play in elementary school. There is a goal, teamwork, and sequencing of actions. It is impossible to know what will happen when you step on a tile without actually stepping on a tile. And sometimes getting spiked. Or blown up. Or lasered. Or falling off the edge. At which point you begin the level again with that data and avoid the activity that just got you killed. The two video game experts in the room anticipated this, planned for it, and then chuckled at the new way we’d found to destroy ourselves. The two newbies apologized every time. Even with teaching about the growth mindset, it’s hard for me to keep this from feeling like failing. If you give me a goal, I want to go directly there, but I also realized the resilience my brother has developed while gaming directly relates to his ability to respond appropriately to setbacks in his job. Playing games this weekend ultimately had me thinking about some of the struggles that some of our best students have with research. Coordinating the Capstone Scholars at my school, I spend two periods a day with students who are grappling with large-scale independent research projects. This is the first time they are creating their own targets, measuring their own progress, and following their own interests. Each has an internal faculty mentor and an external academic mentor, and my role is in helping them navigate this process. I honestly don’t know that I would have had the maturity in high school to motivate myself the way that they do. For students who have always been “good at doing school,” it’s a substantial adjustment to learn for yourself when it’s not clear if you are successful on a day-to-day or week-to-week basis. They are making up the rules as they go and trying to follow their own moral compasses. Without an external measure of success from a rubric or a transcript grade, the notion of success morphs. There is no answer that I can provide, and the amorphous shape of real-world research can be overwhelming. I can’t pretend that I was playing video games these past few days to learn a life lesson, but I can tell you that I want to take the notions of contextual knowledge and resilience back to our top students. No one is perfect, and no one gets it right 100% of the time. But we more often celebrate our successes publicly and cover over our insecurities privately. I think that’s why there was such a strong commiserative response in our community to David Wee’s post about Messed Up Library Lessons. We’ve all felt this way, but how often do we acknowledge this to our peers, to our students, to our families? University of Houston professor Bene Brown’s TED Talk on the Power of Vulnerability has been viewed over 36 million times, likely because we all have times when we’re afraid to be vulnerable. 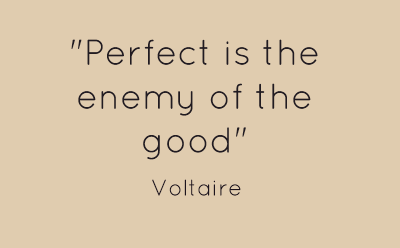 As a perfectionist, this post is tough to write. If I get my credit card privileges back, I will guarantee you that losing it was the most effective way for me to learn a system in which I will NEVER forget to reconcile my statement. I might forget other pieces of office work, but not that. Failure is a powerful teacher. Let’s all keep learning and striving for success and setting up libraries where our students are empowered to do the same. *Full disclosure—I did reconcile my account the morning of the 1st but then my Amazon order, which had been broken into four parts, despite being shipped in only two shipments, posted two more transactions that afternoon. I hadn’t tallied up the totals of the two I had paid to realize that the order was incomplete. I fully admit that in two earlier months I had forgotten to even enter the system, but a simple calendar reminder is all I needed to solve that problem. So I’m still going to argue that Amazon deserves part of the responsibility here. And if you have had success stopping this sneaky accounting, you’ll be my hero and a hero to all Amazon users at our school! As we approach the start of a new school year (welcome back all! 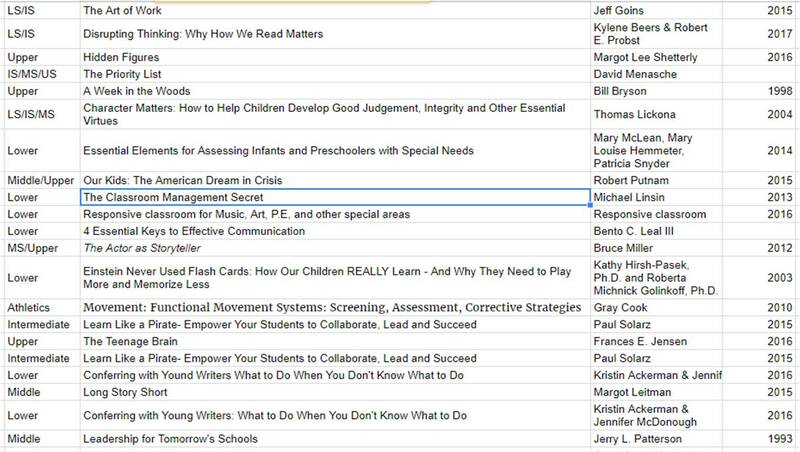 ), I wanted to reflect on this year’s Critical Literacy Summer Institute. Southern California brought the largest group in the history of Summer Institutes for days of deep discussion regarding research, the news, inquiry, and what it takes to craft a great question. The Willows School library blends indoors and outdoors—and many of us couldn’t resist climbing Baldwin Hills Scenic Overlook after watching all the hikers from the base. 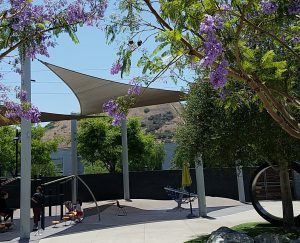 The planning committee accounted for southern California sunshine and 80 degree days, and we split our time in interactive lectures, workshops, small group discussions, and insanely fancy snack breaks (think brie and smoked gouda). I have to admit that I never even got to perusing the project I brought to revise because I used breaks to continue conversations and delve deeper. If I had to state an overarching message, it’s that there’s always space to dig deeper, question further, and learn more. The presenters were gracious enough to share their presentation slides on the libguide, and I have linked to them directly below. Since we spent a half day thinking about developing questions, I challenged myself to think of my three main questions as a response to each workshop. This is my public declaration of my takeaways, not a summary of the sessions themselves. Feel free to get in touch throughout the year to see how I’m approaching finding answers and the way this shapes my teaching. What sources do I find necessary in my own life, and how did I develop the skills to evaluate them and place them in the context of the larger information landscape? In teaching, what parts of the research process do I have standardized and structured, and which parts are individualized? What are the consequences in allowing for serendipity but also wanting equity of service? How much time do I let students feel uncertain about their progress in the “exploration stage” of research? Am I considering that they might be falsely optimistic about their work if they move to the “clarity stage” before they’ve placed their research in the proper context? With the anchoring bias fully a part of my students’ experience, how do I get them to keep an open mind as they learn about topics beyond their first impressions? Can my students accurately assess if they are evaluating sources as they search, and is their confidence in their skill warranted? When I ask my students to think of the beginning stages of research like “asking a trusted friend,” how can I get them to tell me where they really go (Wikipedia) versus what they think I want to hear (JSTOR)? 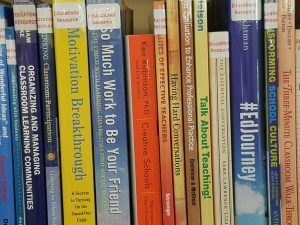 How can I get comfortable with filming myself to create a repository of library resources that are available to students at their convenience? Since students trust teachers and family more than the news itself, how do I integrate the process of evaluating the news as a professional with my own personal beliefs and share this with students who are trying to develop an understanding of the world around them? Can I convince administration that digital natives may still display digital naiveté? Their tech savvy does not necessarily translate to media literacy but rather a familiarity and comfort with the format. This isn’t a question, but let’s celebrate media literacy awareness week from November 5-9, 2018! A media literate person interrogates the message, the media creator, and the media consumed. He or she thinks about the ways that different people might perceive the same message and how this affects our values in a democracy. Now for the question, what are some creative ideas to make this exciting for my school community? How many closed-ended questions do I ask compared with open-ended ones? Even for open-ended questions, are their answers I am hoping for more than others? I’m suspicious this may be the case, and would like to work to truly build an open-minded culture of inquiry. View from the library with a scenic hiking overlook beckoning us to climb! So now you have a record of what’s on my mind as I welcome students back for what’s already scheduling itself to be the busiest research year yet. It’s fun to watch something grow over time, and I hope you all are as excited as I am to build on research programs with students and teachers. Looking forward to learning more and connecting in person in Boston in April! My younger self would have shaken this off as unprofessional, but make sure you take care of your own needs too. 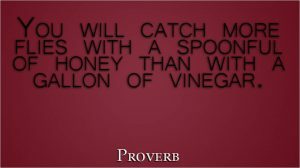 So many of us put any help we can give a student or teacher first, which is great, but starts to become more difficult if you haven’t had a solid lunch in two weeks. During January, my base schedule is five teaching periods a day before adding other classes and lunch meetings, and, you know, running a library. Freshmen invaded the library (in the best possible way) during their study halls. 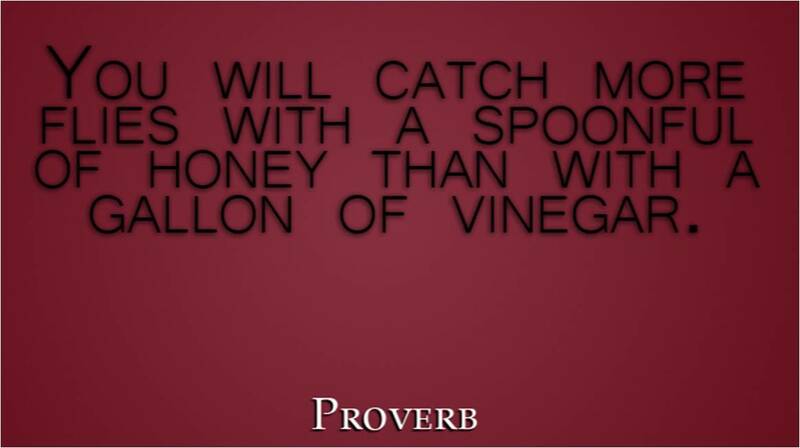 Recipe for getting hangry? It was awesome that I could look at the teacher on the craziest days, and she’d motion for me to take a brief banana-peanut butter break. Those few minutes of silent sugary protein brought me the next 85 minutes of helpful answers. This is true for students too. Not just with food, but in a broader sense that there is a lot going on in their lives. Concerns about friendships, other course work, jobs, or a basketball regional might be foremost in their heads on any given day. Giving a brief brain break to stretch or grab water or just listening to their concerns works wonders with getting them focused again. Ask for student volunteers as class examples. Use your voice and those of your collaborators to build a culture around research in your school. This may require some creativity on your part, but it helps legitimize student work. 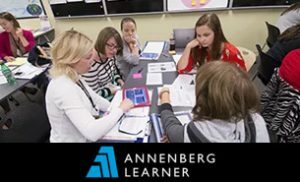 Build an advisory session where students reflect on their budding research skills. Ask English teachers to talk about the ways that History and English research papers compare. Have Writing Center tutors “pop into” Western Civ classes unexpectedly to advertise their services. When the whole community rallies around you to help you succeed, you want to try just a bit harder to make that happen. The inspirational Alyssa Mandel will be speaking about Not-Papers at AISL Atlanta next month, so mark your calendars. For the research project I’ve been discussing here, we do have a final paper. But that final paper is worth 50% of the project grade. The other 50%, for which students could theoretically earn full credit even if they never submitted a final paper, is entirely process. There are over fifteen daily checkmark grades. Items like creating a Google Drive folder, sharing three topic ideas, writing a half page of notes, sketching an outline, and completing a peer’s Ladder of Feedback. I must admit, however, that we adapted the full-credit process grading a few years ago. Now the full outline and rough drafts earn both checkmark grades and more nuanced grades. We did this for three reasons. It helps them take these deadlines seriously. It gives them a sense of whether they are on track to successfully write a paper. And it keeps them automatically from earning 100% for an entire month in our online grading system. Other than that, as long as the student follows along, I get to focus on process and the teacher can focus on product. Give “easy points” so procedural tasks earn 100%. 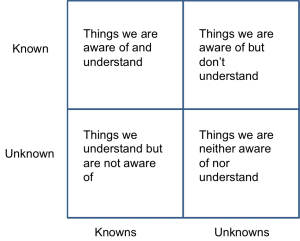 I love the structure of a rubric, but I hate thinking about points. I have joked with kids that I became a librarian so that I could just help them learn without grading their work. But we are a school driven by grades, and for most of our students, grades matter. They are likely to struggle with conceptual tasks like analysis and synthesis. But the little structural pieces matter too because they suggest a level of seriousness to the work. I believe those structural pieces, like a title page, correct spelling, and a perfectly formatted bibliography, trick the reader into trusting the argument a little more readily. Plus it’s good training for future writing where the details matter: little things like a college resume or job cover letter. I think it’s important to waste spend my time going over bibliography drafts individually with students, asking them pointed questions about alphabetization and spacing even though we just covered this together as a class. They pay attention when an adult asks about their work, and they’re more comfortable returning for future projects. They get the sense that I really care about helping them perfect this part of their work and they get the easy points, as much as it pains me to say it. When our alums return for a panel discussion about life in college, they stress time management. Not that they don’t procrastinate, but that they are more strategic procrastinators. Have you tried giving your students a little space during working sessions to use their time wisely…or not? We are explicit that this is part of their learning process and we won’t make them work. We give suggestions about limiting distractions—like turning off device notifications, sitting at individual computer carrels, or listening to a preplanned “focus” playlist. During the first block research period, we observe but don’t interfere. In future individual research meetings, we ask them to reflect on how they’ve been using class time, and we do sometimes assign specifics for students who aren’t quite ready to motivate themselves on their own. But our goal isn’t for them to work when we are looking over their shoulders; it’s to prepare them to work on their own when no one is watching. Since the lesson plan and the lived experience don’t always match, here is my addendum to the previous paragraph. Last month, 3 classes were on track with learning age-appropriate time management skills. Two weren’t. In frustration, the teacher and I turned to each other after a boisterous block period and asked, aren’t people supposed to be able to focus for 20 minutes? Because I love Post-it notes, the next day we showed up in class and had everyone write their goal for the period. Then, we talked about breaking that into smaller goals, specifically identifying a silent 20 minute task to start. If they had questions on their individual papers or wanted to be first to talk to us after the 20 minute “test,” they wrote it on the back. It may have been born of necessity, but it worked amazingly. And kids kept asking for Post-its during future classes. We all know it, but it’s new to high schoolers that their next task isn’t to “write their paper” but to write three sentences or check that their As have Bs in their outlines. If you’ve worked with classes where students are working independently, you know that two types of students tend to dominate your time. There are weak students, who you don’t want to get left behind, even as they try to stay invisible. And there are the strong go-getters, who would probably sit right next to you for the entire project and ask a question every step if they could. But what are you doing to make sure you’re reaching the quiet average students, the ones who complete every assignment and who would never think to interrupt you while you’re meeting with another student? Can you schedule individual meetings with students once a week? Or comment more thoroughly on their work? These are the kids that it’s easy to overlook when others are vying for your attention, and it’s worth some effort to make sure these good kids aren’t forgotten. This is a particular weakness of mine. I tend to focus on the students in front of me, and I’d greatly appreciate your suggestions about how to strategically plan to serve this demographic. Debrief with students and with teachers. 20 minute tasks wasn’t anything I thought I’d be writing about. Honestly, I didn’t think I’d be thinking about it after a random Wednesday when I just wanted students to pay attention. But in debriefing sessions with their advisors, where students presumably felt the most comfortable, this was the top lesson they said they learned. Every time I complete a collaborative project with a teacher, I take a Post-it note and paper clip it to the top of the lesson with the dates, what we did, and what I’d change for next time. Then it gets filed away. This process has helped me prepare more efficiently for last-minute requests, and it provides me a few minutes to reflect. With whatever kind of organization system you keep, this is something I’d recommend. Perhaps a plane ride was a bit long for uninterrupted writing, so I apologize for the Giant Block of Test ™. You get a sense of the types of questions I ask myself as I transition from one task to the next. Please add any thoughts below. I’d love to hear what tips I can learn from each of you. “AHA moments” result from random encounters. One of my advisees recently surprised me with this as a Christmas gift. 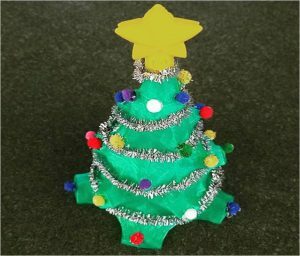 It’s shiny, hand-decorated with sparkly bits, much lighter than you’d imagine, and made from her home 3d printer. Her home 3d printer. She received it last year for Christmas, and apparently the model retails for approximately $250 dollars. 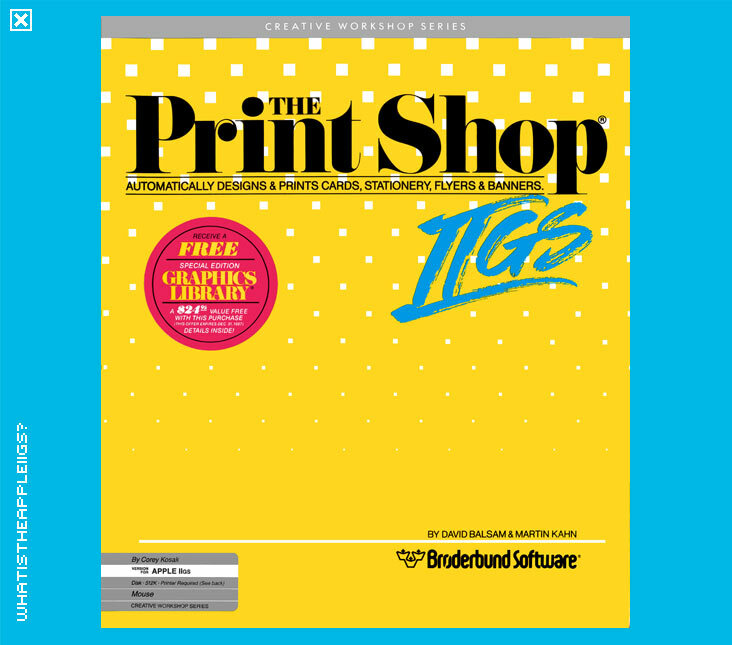 I think that’s proportionately—and maybe even in real money—less than the black and white paper printer I had in college. How times have changed. What struck me, however was not the gift itself. It was the normalness of all of this for her. When I was in elementary school, my dad bought an AppleIIGS computer. I was obsessed. And despite the bad rap that some computer games have, my parents knew what they were doing. 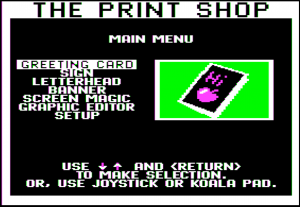 The only games I remember playing in the early years were “Where in Time is Carmen Sandiego” and “Mavis Beacon Teaches Typing.” Those games and also “The Print Shop.” If there was a birthday/yard sale/dinner menu happening, you can bet there was an accompanying card/banner/sign. For those of you unfamiliar with “The Print Shop,” it was a software package that “provided libraries of clip-art and templates through a simple interface to build signs, posters and banners with household dot matrix printers.” My grandparents were always thrilled to receive a card designed by me and printed in color on our very own home printer that could be counted on to screechingly and consistently print one page per minute. For me, nothing seemed strange about having a home printer producing cards. 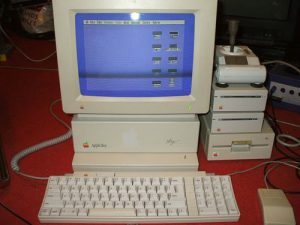 They never imagined home computers would become ubiquitous. Changing search strategies. Google has gotten much better at anticipating searches and providing information directly in their search engine. A few years ago, we barely had tabs and content didn’t automatically synch across devices. As an iPad school, I love that I can airdrop materials right to students’ devices. Google Drive, Libguides and other options for easily sharing information and collaborating in the cloud. It’s so easy to create and share. The burden has shifted to organization. Free Amazon two-day shipping for items needed immediately for projects. Federated search engines, imperfect though they may be, that make it easier for students to use the databases that libraries purchase, and to find and cite the information they need. The rise of visual search, especially in student presentation preparation, from image matching and location recognition, to sortability options for the ideal image. Author Skype sessions that are less costly than in-person visits and the new AISL webinar series that lets us learn from our inspirational colleagues outside of the time and space constraints of the annual conference. Conversations around the terms libraries, learning commons, and maker spaces. The fact that we need to specify the need for quiet spaces in our bustling collaborative spaces is a world away from the shhhing librarian. SMARTPHONES- ie. the ubiquity of the Internet. Need I say more? 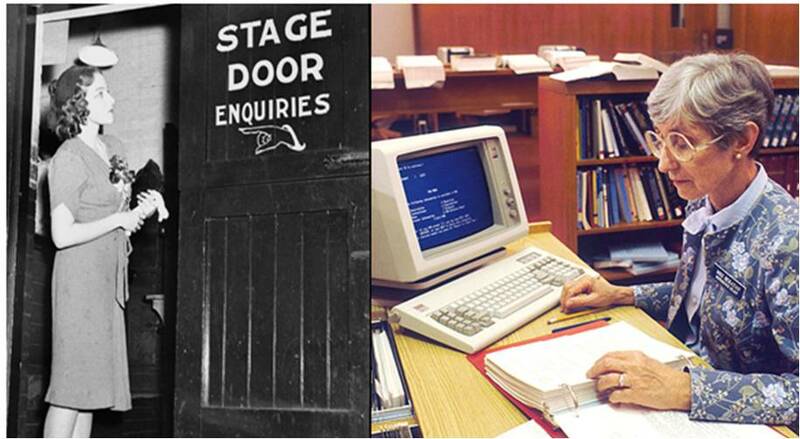 There is always hand-wringing about new technologies. But there’s also the potential for positive momentum. We’re continually recalibrating towards a new normal. 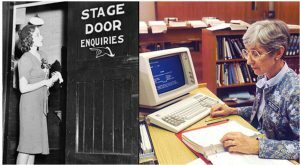 Since we’ve all entered the fields in different years and even decades, I’d love to hear your perspectives on the specific technologies that have changed schooling and your role in librarianing. Just some food for thought this holiday season, and I hope everyone enjoys their semester breaks. Abstract: Communities need the public library now more than ever. In an era when neighbors are more divided than ever, and even the nature of truth and facts are in question, how do librarians best serve their community? 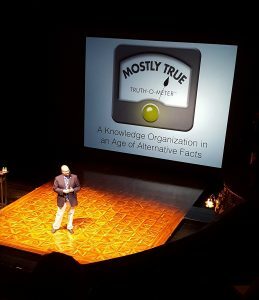 This presentation makes the argument that our communities do not need more information literacy, a greater emphasis on quality information, or a neutral institution. Rather our communities need trusted partners helping weave together common understandings of events and priorities. You can watch the entire presentation here with audio and slides at https://davidlankes.org/?p=9237. Lankes believes that public libraries are safe places to explore dangerous ideas and that librarians must change their mindset from serving the community to being part of the community. We should work off of emotional intelligence (EQ) and not just facts. He talked about the difference in the statements “How can I help you?” and “What are you interested in today?” The first implies that we are serving patrons, and the second gives them ownership over their interests. Get out from behind the reference desk. In particular, in relation to school libraries, he questioned the information literacy courses that we teach and value. This is difficult for me. I love teaching information literacy skills, and I think that they are valuable for our students. In fact, I’m still not sure that I buy his argument. Lankes said that some of the fake news controversy that we’ve been confronting over the last year is a result of such courses. Information literacy training leads to greater confidence in one’s ability to evaluate information, but not necessarily greater ability. This struck a chord with me. I’ve seen it with my own students. His other reason is that “every tool we give to evaluate is one people can use to manipulate.” There are marketers and political analysts who will utilize what information literacy courses teach to make their sites seem more legitimate or more neutral. When making websites, these individuals will make sure that it appears to pass the CRAP test or whatever checklist your school uses. This is true, but there has to be an answer in how to teach students to be more effective information consumers who can interact critically with sources across the ideological spectrum. 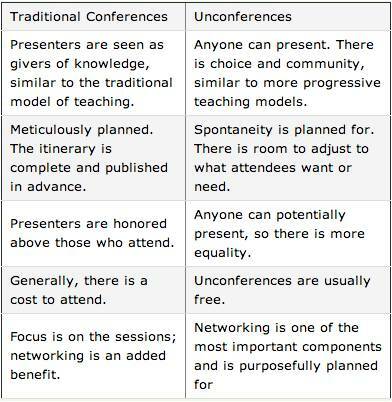 This is a paradigm shift for librarians. Even if we don’t agree wholeheartedly, it’s important to have conversations about information literacy and librarian neutrality. Thoughts? Our 2016-17 school theme was “Re-imagine” and the division directors thought it would be fun to reimagine our professional development reading for the summer. In past years, all directors sponsored a book of interest. Teachers chose any of the five books and attended a discussion led by the director during our preseason week. Fairly standard procedure, and it worked well. Based on the success of our EdCamp professional development day last January, they decided to try a similar approach to summer reading. At EdCamp events, participants create an agenda on the spot and lead impromptu sessions based on areas of shared interest, need or expertise. Summer is around the corner and with that comes our annual summer reading request. We’ve Re-Imagined for this summer and are going with an entirely different approach. 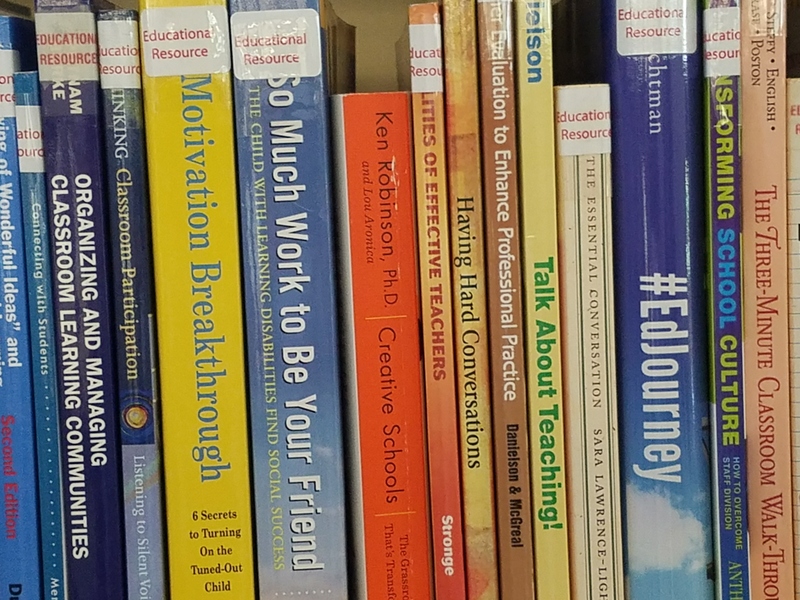 Being that our EdCamp Professional Development Day was such a hit, we’re going with an EdCamp Books where everyone has his/her own choice of book to ignite their passions. Your job is to choose a book you’ve never read before and return in August ready to share what the book meant to you, how it might affect your teaching, your daily interactions, etc. We will keep a list on a Google Doc, so please add your information as soon as you decide the book you’ll read. Some of you may join others in reading the same book. However, we are hoping for some outside of the box books and thinkers that will introduce us to a variety of books and insight into our colleagues’ passions and interests. We met in predetermined but random groups, and discussions formed organically. In my group, we found some themes common to our reading and offered the best tips from what we had learned. The hour flew by, and I made a note of several teachers with whom I’d like to continue the conversation in the coming weeks. Summer reading is something like a fingerprint for each school with each program varying based on the school’s personality. If you have success stories of your own or questions about what we tried, please write them in the comments below. 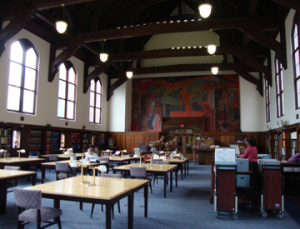 When I attended my first AISL conference in Baltimore, I remember being surprised when a casual conversation between calm librarians heated up quickly. The culprit? 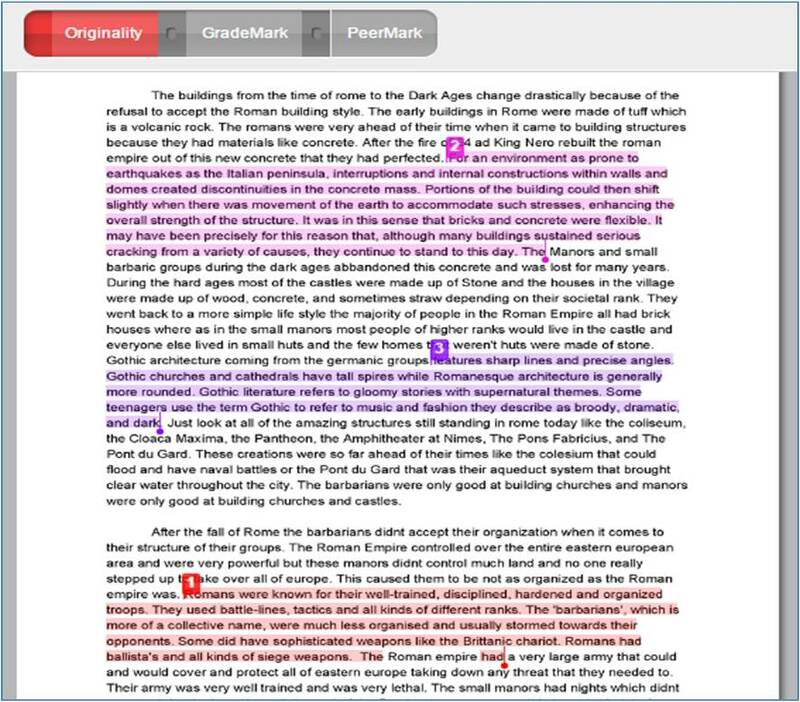 Turnitin, the iParadigms software that reviews student work for plagiarism. I inherited administration of Turnitin when I started at my current school, and I knew little of the service beyond its scary reputation. (Admit it, how many of you are happy to have graduated before the age of information overload and originality algorithms?) The students called it the “cheating program,” and from what I could tell, the purpose of Turnitin did indeed seem to be ferreting out plagiarism. I doubt my students were some of the 30 million who “trusted’ the program. In the past few years though, I’ve been very impressed with Turnitin’s services. We are now very conscientious about the ways that we refer to it with students, most particularly in calling it an “originality checker.” Teachers set up assignments to allow for multiple submissions until the deadline so students can check their own work. I’ve heard fear from others that this will lead to students figuring out how to change just enough of their work not to be caught. But, our hope for a synthesis paper is incorporating other’s ideas, and it’s something we are trying to teach them to do effectively while citing their sources. Why not make the process a bit more transparent to students who are just learning? In my experience on my school’s Honor Council, students generally cheat out of laziness. Thus anything that gets them to spend more time interacting with the source texts and their own writing is a benefit. -Turnitin provides a visual representation of synthesis. We ask students to review their own work and to look for color mixing rather than color blocks. 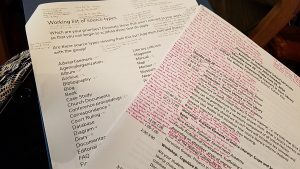 This gives them a way to scan their own material and see if they are integrating sources effectively or writing a series of article reviews. It’s also helpful for research-based papers for students to see the green-yellow-red marking of the similarity index. If they are at a blue 0% match, they probably haven’t done enough research to prove that experts agree with their argument. If they are above 20%, they probably haven’t done the hard work of translating the experts’ research into their own paper. 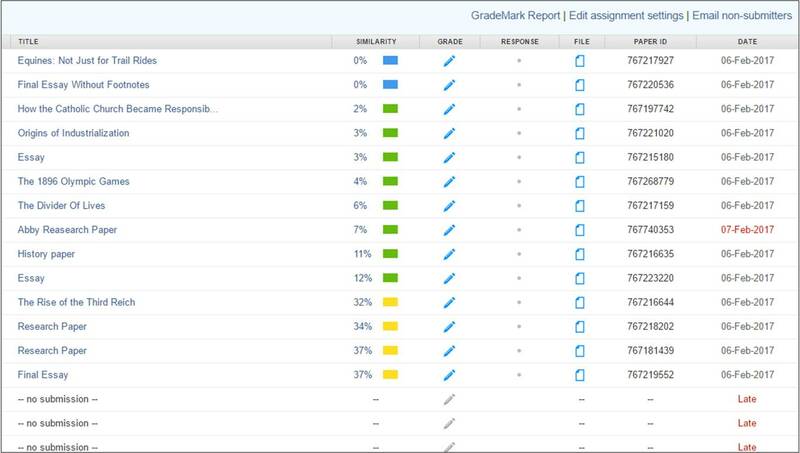 -The ways that Turnitin lets readers offer feedback on assignments are fabulous. We don’t even regularly use all of the features, like the grammar checker or the rubrics, though I hope that use increases more next year with our integration (see below.) Students love hearing voice comments from their teachers. Tone carries better in verbal communication, and teachers are forced to comment on the papers as a whole, rather than specific grammar issues. Students can also review each other’s papers, and this works well for an entire grade to receive peer review that can be completed electronically, anonymously, and outside of class. The extra time spent revising shows the importance of writing as a process and improves the overall product. -Turnitin relieves pressure from teachers, especially in fields outside of History and English, to know when plagiarism has occurred. All papers are submitted to Turnitin, and so teachers don’t get the reputation of being “easy” or “tough” on plagiarism. It is a part of the school culture and standardized across departments. -Finally, on cases when plagiarism is suspected and students are sent to Honor Council, the Turnitin report is a valuable tool in showing the student what he did wrong. Honor Council representatives have this report to validate their assessment of the case and can use it as a teaching tool for the inevitable revision that will occur in the weeks following the case. On the other side, not everything has gone well. -The customer service relies on an antiquated email ticket system. It can take days to communicate back and forth to solve seemingly minor issues. 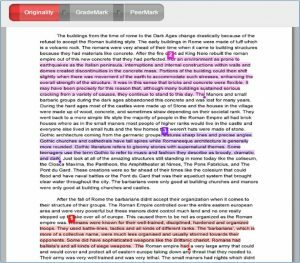 -With no apparent pattern, Turnitin has occasionally flagged student work as plagiarized from an earlier version of the same assignment. This has not happened frequently but causes student panic when it does. 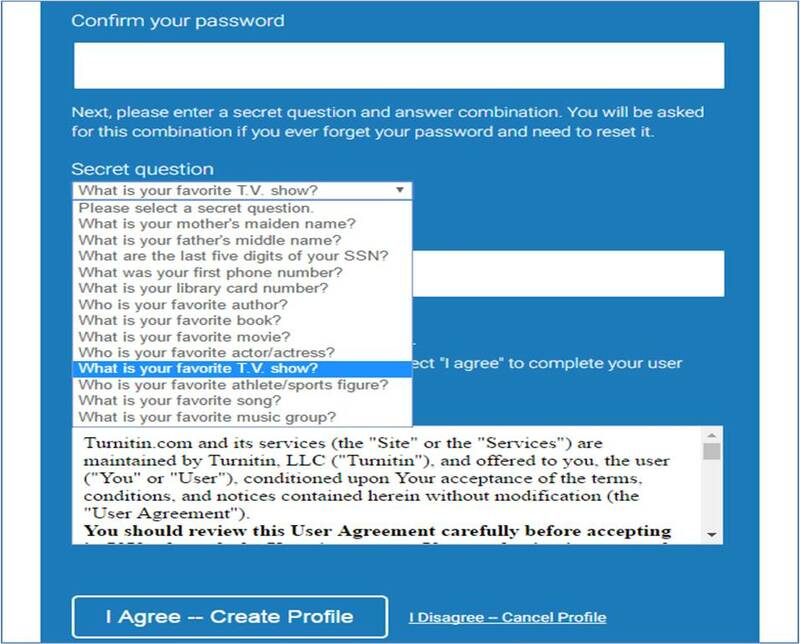 -Students tend to forget the email that they used in middle school to sign up for the account, and the site asks asinine questions to authenticate the account. How would the “you” from eighteen months ago have answered some of these? -The filter features for turnitin are unreasonably blunt. While the site claims that you can filter by quotation and by number of words, I haven’t found that these work particularly well. Even worse, my Tech team can’t figure out how Turnitin decides where to place the origin of words that appear on multiple sites on the web. Think of cases where something is printed in a magazine article, copied to Wikipedia and then used in many student papers. How does Turnitin decide which particular source to list, and why can’t it list all the sources? 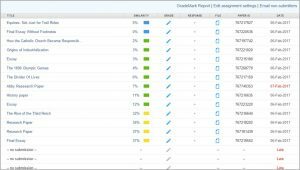 Turnitin has finally created integration software for our course management system. We used to have this integration with Schoology, but they didn’t offer it for our current platform. 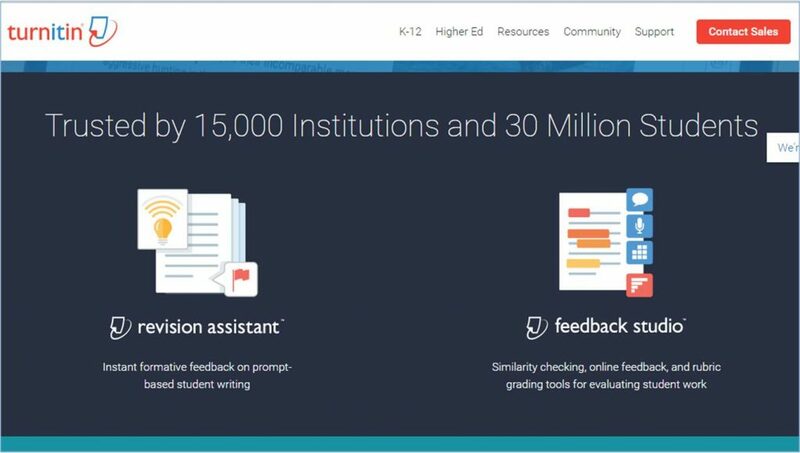 Starting next fall, teachers will be able to create assignments that students will submit to Turnitin straight from SSESonline. I can’t wait! Please continue the conversation below. Do you use Turnitin or some similar software? How does it work for your school community? Do you have suggestions for how to use it better? Even though the weather is in the high 70s here in Florida, as I pack for a weekend trip north to visit family, my thoughts turn towards long summer days. I always find February is the time when I can’t help planning summer travels. Sometimes there’s amazing synchronicity when where I want to be coincides with a professional development opportunity. 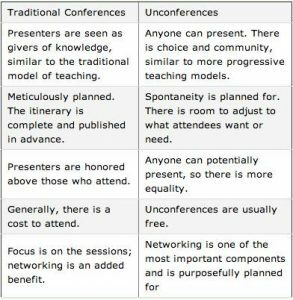 Here are a few to consider for 2017 or future years, with a focus on low-cost programs and those that pay attendees. NEH offers tuition-free opportunities for school, college, and university educators to study a variety of humanities topics. Stipends of $600-$3,300 help cover expenses for these one- to four-week programs. There are over 40 programs for 2017 spread throughout the country with a March 1 application deadline. The Fulbright-Hays Seminars abroad provide opportunities for overseas experiences in non-Western European countries. Seminars are designed to provide a broad and introductory cultural orientation to a particular country or countries. The deadline for the 2017 summer programs has passed, but keep your eyes out for an announcement of the 2018 countries. Immerse yourself in the practice of teaching with primary sources from the unparalleled collections of Library of Congress. 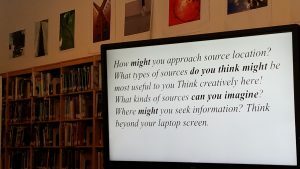 Each Institute week, Library of Congress education specialists modeling strategies for using primary sources to engage students, build critical thinking skills, and construct knowledge. 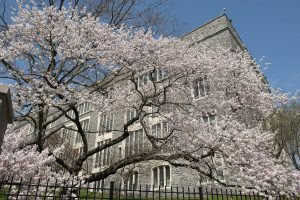 2017 offers two specialized sessions, one on WWI and one on STEM, as well as their general institutes. The Teacher Institute is a six-day seminar held at the National Gallery in Washington D.C. that helps K–12 teachers strengthen their knowledge of art history and integrate visual art into classroom teaching. The program features lectures, gallery tours, teaching strategies, and hands-on learning experiences. The 2017 seminar examines visual art of the Renaissance from the independent city-states of Italy and the Low Countries during the 14th through the 16th centuries. 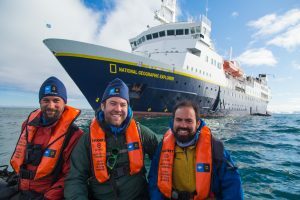 Fellows learn the importance of geographic literacy while traveling on ships and working with National Geographic researchers. 2017 regions for exploration include the Arctic, British and Irish Isles, Canadian Maritimes, Iceland, the Galapagos, Antarctica and more. The 2017 deadline has passed, and starting in 2018, applicants will need to be National Geographic Certified Educators. Scholars and master teachers lead these one-week seminars in American history. Seminars are often held at places with a direct connection to the topic at hand, giving participants a rare opportunity to walk historic grounds, examine original artifacts, and study primary source documents in the same places where significant events occurred. 2017 seminars cover American history from the Colonial era though September 11, 2001. Seminars are fully funded for public school teachers, but there is a fee for independent school teachers. 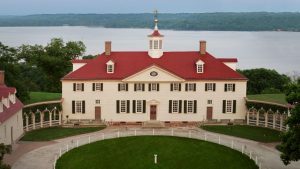 The George Washington Teacher Institute Summer Residential Programs are 5-day immersive experiences at Mount Vernon that teach about the life, leadership, and legacy of George Washington and the 18th-century world in which he lived. The 2017 deadline has passed. The 2017 application hasn’t been posted yet, but I hope this free three-day program at DC’s Newseum continues. This program looks at the past and future of the first amendment in regards to primary sources, the freedom of the press, ethics, and media literacy. There is a focus on technology integration in schools. This fellowship provides a $4,000 stipend to allow a qualified children’s librarian to spend a month or more reading at the University of Florida’s Baldwin Library of Historical Children’s Literature, which contains a special collection of 85,000 volumes of children’s literature published mostly before 1950. Applications have closed for summer 2017. After my affordable options, this is pricey “luxury edition” for those with extra professional development funds. I’ve heard high praise, particularly in regards to quality of the academic libraries. The seminars are based in the world’s greatest centers of culture and learning – including Cambridge, Paris, and Oxford, and they are led by distinguished Humanities scholars. Last, but certainly not least, remember AISL’s very own Summer Institute All School Reads: Making Book Day Work at Your School hosted at Horace Mann School in New York City from June 27-29. This is the beginning of a list that will be more helpful to all of us if you continue to add your own thoughts below. Happy summer planning!